As a young man in Montana, Shawn Wagner followed in his father’s footsteps and joined the U.S. Army. 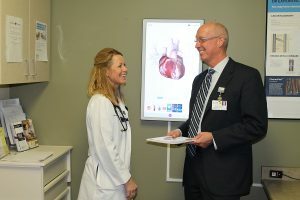 Now, 35 years later, Shawn is a colonel in the U.S. Army Reserves and serves as the director for the Army National Disaster Medical System (NDMS) and vice president of OSF HealthCare Cardiovascular Institute. Shawn has come a long way from his early assignment as a helicopter medevac pilot, and he is now a leader in health care administration. His responsibilities with the U.S. Army Medical Command are to coordinate patient movement support during disasters and possible military contingencies. Shawn coordinates with several federal agencies to sync patient movement efforts during a disaster response, and is also responsible for contracting with 140 NDMS partner hospitals to support patient movement and definitive care efforts. At the request of a respected friend, Shawn joined OSF HealthCare in 2012. He attributes his military training with providing him with the tools he has needed to succeed as leader. He encourages all veterans to take advantage of their training and continue adapting to find their niche. As an affirmative action employer, OSF HealthCare invites all veterans to search osfcareers.org for available positions.